Today's military missions are characterized by joint operations of multinational armed forces. Today's military missions are characterized by joint operations of multinational armed forces. Interoperability of the equipment, especially in the field of communications, is therefore the primary objective of the international partners responsible for creating one of the most important aspects for efficient cooperation. The R&S®M3TR features maximum flexibility in terms of frequency bands and waveforms for practically all services and platforms. The R&S®M3TR software defined radio family is a new generation of high-performance digital radios. The heart of the new integrated communications system is the lightweight R&S®MR300xH/R&S®MR300xU manpack radio, which offers solutions for all aspects of tactical communications as well as uniform and reduced interservice logistics. A lightweight handheld version (R&S®MR3000P) complements the radio family. Like the manpack radios, the R&S®MR3000P supports both open and secure communications modes. For applications using various services and networks, different types of radio units were previously required. The R&S®M3TR covers the entire spectrum from the HF via the VHF to the UHF band, allowing interoperability as well as uniform and reduced interservice logistics. The frequency flexibility of the R&S®M3TR meets various national and international regulations, providing global operation in fast-changing missions and environments. A software radio not only offers flexible network solutions, it also integrates existing national or company standards into a single unit. Due to optimized protocols and waveforms, the R&S®MR300xH/R&S®MR300xU attains maximum throughput rates for digital voice, data and position location. 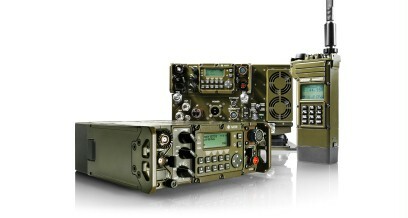 The multirole features of a software defined radio are mainly determined by its ease of integration into tactical communications networks. In addition to its use as a functional terminal in the individual subnet, e.g. CNR or PRN, it can also act as an interface between the various subnets. The R&S®M3TR can be used on diverse platforms and features interfaces to fixed networks such as WAN and LAN, as well as intelligent gateway and relay/rebroadcast functions such as routing of selective calls for subscribers inside / outside the home network. The R&S®M3TR radios offer many diverse functions that help ensure straightforward, secure and errorfree operation. The functions are available via hierarchically structured menus and context-sensitive softkeys. The clever concept and the arrangement of the control elements allow intuitive control of the radio even under difficult conditions from outside and without having the removable front panel in view. As a software defined radio, the R&S®M3TR is able to run a wide variety of waveforms. To provide radio systems that perfectly fit customer needs and applications, radio software can be ordered on the basis of communications requirements. Upgrades by adding new waveforms or extending the frequency range of radio networks are also possible in this concept. Communications networks can therefore be tailored to always find the best compromise between current communications needs and budgetary setup. The R&S®SECOM waveform (R&S®SECOM-V for the VHF and UHF bands, R&S®SECOM-H for HF) with its high hop rates and secure synchronization is setting new standards. It ensures powerful protection against detection, interception, jamming and spoofing. User data (digital voice or data) is transmitted completely digitally and in encrypted form. Within one R&S®SECOM-V net, several subnets and sublinks can be established simultaneously in the point-to- point and point-to-multipoint modes. Network synchronization and access can be planned and controlled individually for each user. Methods such as late net entry or hailing (R&S®SECOM-V) are available for this purpose. R&S®SECOM is a combination of COMSEC and TRANSEC for encrypted voice and data communications in the frequency- hopping mode. The COMSEC part of the R&S®SECOM method is based on the R&S®RSCA crypto algorithm developed by Rohde & Schwarz. The method uses key lengths of up to 256 bit (approx. 1077 variants). Assuming uninterrupted transmission, the same bit sequence would be repeated after about 2 × 109 years. The keys required can be distributed by means of a key distribution device or directly from a PC. All keys are encrypted and the deciphered original is present only in the read-protected security processor. Crypto units complying with NATO standards such as ELCRODAT 4‑2/R&S®MMC3000 may be used as an external option. To plan communications networks and links, a PC-based radio network management system is available. This tool allows users to generate keysets, plan frequency resources, define user channels and services and set up complete networks of radios. After the desired networks have been defined, the resulting data can be easily distributed to the radios by means of a fillgun or directly by using one of the radios’ data interfaces. R&S®SECOM is optimized for tactical communications and operates in the full VHF/UHF band. It is implemented as a software option running on all R&S®MR300xH/ R&S®MR300xU tactical radios. R&S®SECOM-V was developed to meet as closely as possible the network demands of the primarily land-based mobile users of tactical radio services. R&S®SECOM-V is attuned to the requirements of land forces, where the implementation and management of complex network structures are in the foreground. The primarily hierarchical command structure of the armed forces should be mapped as closely as possible to the communications network. To this end, users can be organized in networks using the same frequency pool and the same key – one each for TRANSEC and COMSEC. Possible address modes are point-to-point, point-to-multipoint and broadcast. Network synchronization and access can be controlled by each user. Late net entry is available for this purpose. The radio automatically performs a net entry whenever synchronization is lost (R&S®M300xU/R&S®M300xH display message: NSYN). The time reference unit of an R&S®SECOM-V net automatically takes care of maintaining synchronization before it is lost. If the time beacon function is not active, a net entry may need to be performed from time to time. Out-of-band hailing is an outstanding feature that considerably enhances the multiband capabilities of the R&S®M3TR radio with cross-band hailing. The latest software release makes it possible to scan FF calls over the entire frequency range from 1.5 MHz to 512 MHz. This means real multiband operation, as even HF calls can be received while operating the radio in the VHF/UHF range. All FF modulation and squelch modes for the detection of signals are supported. R&S®SECOM-H is a Rohde & Schwarz proprietary frequency-hopping HF radiocommunications waveform. R&S®SECOM-H is based on a multiwaveform concept and is designed to operate in environments where a certain percentage of the hop set frequencies are blocked due to either intentional disturbances (i.e. jamming) or unintentional ones, as well as environments experiencing severe Doppler spread and/or multipath delay. It is furthermore based on modem waveforms that can be adapted to the specific characteristics of the HF channel and its propagation. R&S®SECOM-H provides digital voice (low bit rate vocoder at 600 bit/s, 1200 bit/s or 2400 bit/s, adjustable) and data services (up to 2400 bit/s). To ensure reliable links even in severely degraded channels, free hop set search (FHS) is available. FHS is an algorithm for the automatic adaptation of hop sets (ALE-like) based on channel evaluation. Radios in a point-to-point link will generate and use an advanced hop set containing only frequencies that have proven good HF performance. Channels are evaluated by measuring S/N, and results are shared between radios in the link during a three-way handshake. For network synchronization, either the master-slave process or GPS can be used as the network time source. GPS-based network time eliminates the need for manual net entry; all stations in the network remain synchronized as long as the GPS signal is received. R&S®SECOM-P is the standard EPM method for the R&S®MR3000P handheld transceiver. It was especially optimized for use on small, lightweight terminal equipment. Even for this platform, R&S®SECOM-P offers maximum performance and battery operating time. Since R&S®SECOM-P can also be loaded into R&S®MR300xH/U equipment as a software option, R&S®SECOM-P provides full interoperability between all R&S®MR300x transceivers in mixed networks. The R&S®SECOS air-ground-air waveform provides interoperability in the EPM (ECCM) mode between the R&S®M3TR and the R&S®M3AR and R&S®M3SR Series4400 radios. Besides digital voice mode, data transmission with data rates of up to 16 000 bit/s is supported. Both TDMA and non-TDMA modes are implemented. For details on R&S®SECOS implementation in the R&S®M3TR, see the related Technical Information (R&S®SECOS). Network synchronization for R&S®SECOS can be accomplished using the master-slave process via an external time source or by using GPS as the network time. The guard receiver function monitors up to two channels in background mode. This allows operators who are occupied with R&S®SECOS voice or data traffic and receive an emergency call to transmit on one of these dedicated frequencies without having to use another radio. The NATO ground-air-ground waveform HAVE QUICK I/II provides interoperability in the EPM (ECCM) mode between the R&S®M3TR, R&S®M3AR, R&S®M3SR Series4400 radios and various types of legacy equipment. AMBE is the standard vocoder for voice transmission under R&S®SECOM-V. It makes use of the R&S®SECOM-V 16 kbit/s channel with vocoder-specific FEC. This voice mode provides reliable good-quality and jam-proof communications. The data rate can be selected by HMI. The 1200 bit/s vocoder was specially developed for the demanding task of setting up reliable links with good quality under the poor channel conditions usually found in the HF range (1.5 MHz to 30 MHz). As an integral component of the R&S®SECOM-H HF EPM waveform, it is optimized for use together with this frequency-hopping method. For interoperability with R&S®SECOM-V in rebroadcast applications, the 2400 bit/s vocoder can also be selected in the R&S®SECOM-H mode. In the R&S®SECOS mode, the CVSD and AMBE vocoder types are supported. The vocoder type is to be preconfigured by the R&S®RNMS3000 net management tool. The STANAG 4539 HF modem enables self-identifying (auto-baud) data communications (up to 12800 bit/s) in a 3 kHz channel in the HF frequency range. STANAG 4539 is based on more than one standardized modem waveform. The R&S®SECOM-H high-frequency (HF) electronic protection measures (EPM) system is a frequency-hopping HF radiocommunications system. R&S®SECOM-H is designed to operate in environments where a certain percentage of hop set frequencies are blocked due to either intentional jamming or environmental interferences, e.g. atmospheric noise, thunderstorms, or other electrical disturbances. The data rates are selectable by HMI. In R&S®SECOM-V, data rates up to 16 kbit/s are possible. User data rates span from 600 bit/s up to 9.6 kbit/s depending on FEC share and number of retransmissions. R&S®SECOM-V uses binary continuous phase FSK modulation with a shift of 6.25 kHz. R&S®SECOM-V hopping works in the frequency range from 30 MHz to 107.975 MHz and 121 MHz to 511.975 MHz. The modem supports ten different waveforms with allocated bandwidths which can be selected by the user. The data rates as well as the subsciber data rates are selectable by HMI or can be preconfigured by a configuration tool (R&S®RNMS3000). The IPoA embedded radio protocol provides transparent IP functionality over the air. It can be used to set up communications systems that require a transparent connection of IP networks over radio links. IP-based applications – such as situational awareness or message handling systems – are enabled to exchange their data over such radio links. An R&S®M3TR radio equipped with IPoA includes standard static IP router functionality. The network structure can be configured very easily by entering IP subnets to be routed to different destinations over the air interface. Besides the standard IP address of the physical Ethernet interface (which is used, for example, for remote control), a second IP address represents the air interface of the radio. The radio can be connected via an Ethernet connector (RJ-45) to 10BaseT and 100BaseT network equipment (such as hubs, switches, routers) provided by the R&S®KG3031, R&S®KG3032 docking station and the R&S®VT3050C compact amplifier. If IPoA functionality is to be used with manpack radios, the RS-232-C interface (R&S®M3TR data connector at the front panel) is to be used. A PPP connection will be established between the radio and the external system for this application. The embedded IPoA protocol currently supports IPv4 (Internet protocol version 4). An internal address mapping function ensures that data is delivered to the correct recipient. The IP packets are transmitted transparently over the radio channel. Performance of the data link depends on the current channel properties and propagation conditions of the radio link. An error detection mechanism prevents the protocol from delivering erroneous data to the connected network; further error correction techniques (e.g. ARQ secured data) are implemented. Operators can send their own position in a waveform-specific net (R&S®SECOM-V or R&S®SECOM-P). A dedicated radio (GPS controller) can poll positions of all other net members. The GPS controller can be connected to an external application (i.e. command and control software system) to make GPS information available on a digital map, for example. The external application can poll the GPS controller to get the latest GPS information of all members of the network. The polling of GPS information is initiated by the GPS controller. After initiation of transmission, all active GPS providers send their GPS information sequentially to the GPS controller. The transmission of GPS information can be switched on/off at the GPS controller. GPS reporting can thus be stopped. Collisions between individual transmissions of GPS information are prevented. The GPS controller is a manpack or vehicular radio (R&S®MR300xH/U). GPS controllers request the GPS information from the GPS providers either at a user's request or periodically. The common basic protocol standard for ALE is Fed. Std. 1045/46, known as 2nd generation or 2G ALE. 2G ALE uses non-synchronized scanning of channels, and it takes about several seconds to half a minute to repeatedly scan through an entire list of channels looking for calls. The latest ALE standard uses accurate time synchronization via GPS-locked clocks or a time server to achieve faster and more dependable linking. It is generally known as 3rd generation or 3G ALE. Through synchronization, the calling time to achieve a link may be reduced to less than 10 seconds. Although 3G ALE is better and more reliable, the existence of a large, installed base of 2G ALE radio systems and the wide availability of the equipment have made 2G the baseline standard for global interoperability. The R&S®MR3002H/U and R&S®MR3003H/U transceivers support both the 2nd and 3rd generation of ALE in accordance with Fed. Std. 1045/46 and STANAG 4538. PBIT is always performed after powering up the unit. Initiated BIT is executed after manual activation by the operator. Continuous BIT is continuously performed during operation. The BIT enables fault location down to the module level of functional groups. Faults are stored in a fault journal for later evaluation. A net is a set of parameters specifying a configured FF or FH network containing all relevant data for link setup and traffic. Nets are stored in preset pages accessible by the rotary switch of the radio or by the keypad, respectively. Depending on the actual configuration, up to nine (R&S®MR3000P) or up to 99 (R&S®MR300xH/U) presets can be defined and stored in the radio. A channel is a set of parameters specifying an FF channel (e.g. TX and RX frequency, modulation, RF power, etc.). Channel data can be stored in both the manual preset or on one of the remaining 99 presets. In total, 450 channels are available.